One of the best things about summer is the abundance of fresh fruit. Adding fruit to any dish provides a fun twist to lighten it up and to make it more refreshing. With that being said, this Farro, Walnut, and Cherry salad from Cooking Light is exactly the kind of dish I’m talking about. It’s easy and loaded with fresh cherries, a fruit that adds the perfect amount of fruity goodness. Bring those 5 cups of water to a boil, adding the farro and 1/4 tsp. salt and cook for about 15 minutes. Once done, drain and cool at room temperature. 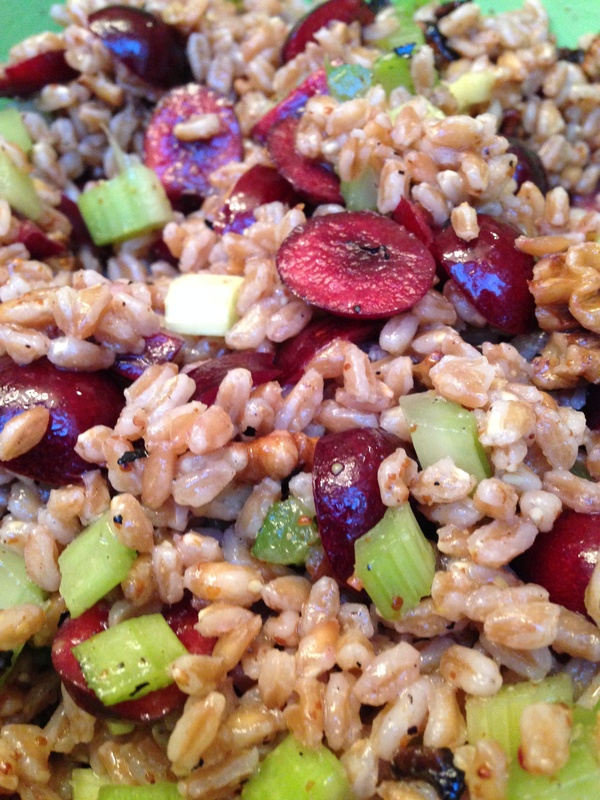 Next you’ll want to combine the farro, cherries, celery, walnuts, and parsley in a large bowl. Then, combine the lemon juice, mustard, honey, pepper, and remaining 1/4 tsp. salt and stir with a whisk. Gradually add the oil and continue to whisk till all dressing ingredients are mixed. Lastly, pour that bowl of goodness over the farro and cherry mixture and enjoy! I loved this salad so much I took a huge container of it back on the train with me! It’s a delicious summer dish that easy to make in bulk (can someone say party side dish??) and it pairs fantastically with grilled balsamic chicken or a tender juicy skirt steak. I’m telling you, nothing beats a summer dish with a helping of fruit. You have to test this out, it won’t let you down. But until next time, keep eating! My favorite part (aside from the eating the salad part) was making the salad. First combine first 6 ingredients in a large bowl and stir using a whisk. Using a sharp peeler, thinly peel asparagus to equal 3 c. of ribbons. Add asparagus and parsley to the bowl and toss to coat with dressing. Next, combine 8 cups water and white vinegar in a large skillet and bring to a simmer. Break each egg into a custard cup and pour gently into pan. Cook for three minutes or until desired degree of doneness. Remove the eggs from pan using a slotted spoon. 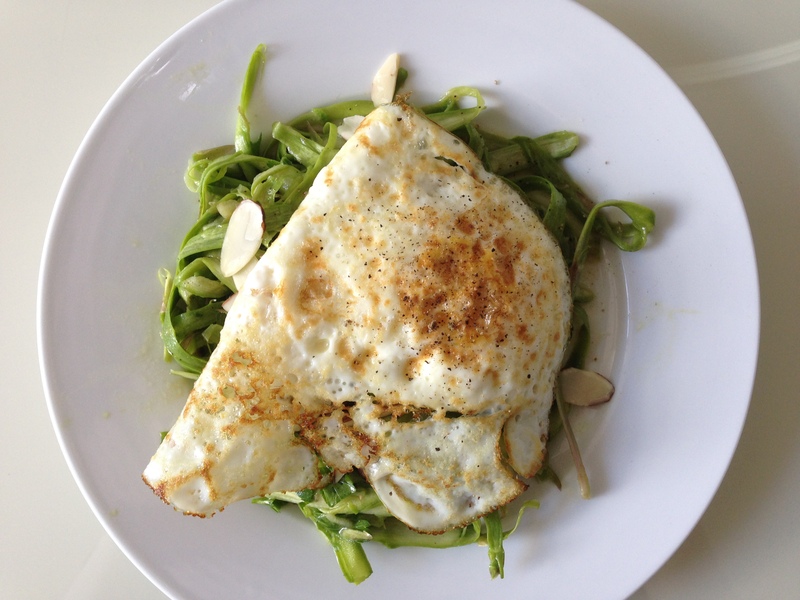 Finally, serve, asparagus on plate first, then almonds, next the egg and finally top with cheese. I unfortunately was under a time crunch and being that I have never poached an egg before I simply fried mine (it still tasted delicious!) but that’s my goal for the weekend. Poach. an. egg. Wish me luck! 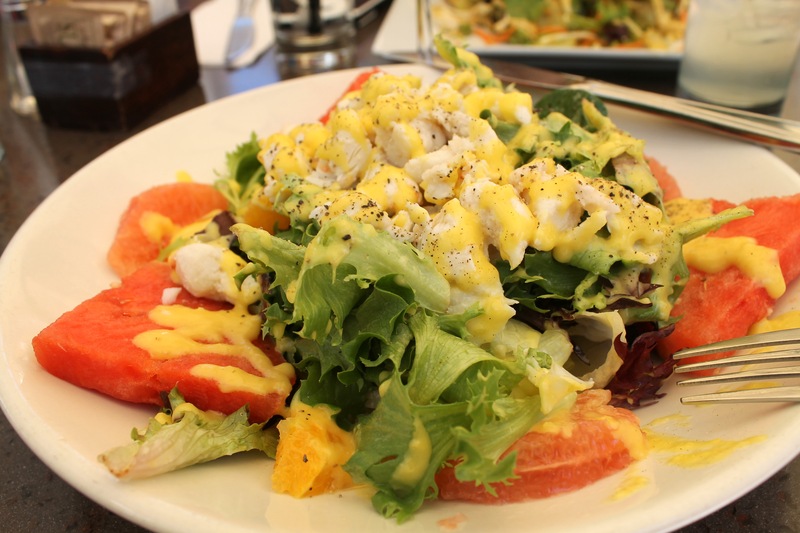 Definitely try this salad, you won’t regret it! But until next time, keep eating! Have you ever had a dish you just can’t get enough of? 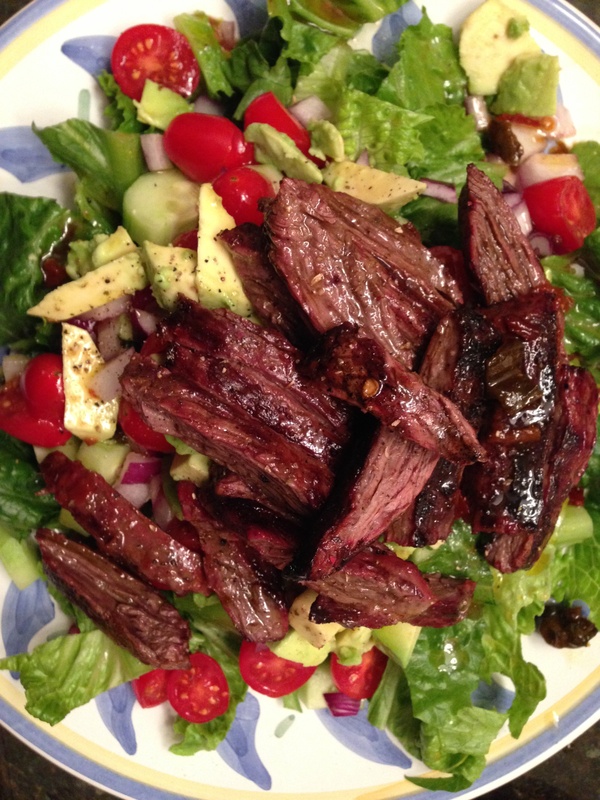 This Southwestern Steak Salad just about does it for me–bet you didn’t think I was going to salad did you?. I absolutely love steak and unfortunately I don’t eat it as much as I would like (but then again I guess that’s a good thing). What I love about this salad is that the spiciness of the chipotle chiles in adobe pairs so well the steak. First, cook the steak however you prefer–I cooked mine on the grill but pan-frying it works just as well. In a large bowl, toss together lettuce, avocado, cucumber, tomatoes, salt, salt and pepper. In a small bowl, combine chile, lime juice, honey, salt, and pepper. Gradually whisk in the olive oil and any juices from the steak (this sounds a little gross but TRUST me this takes the flavor to a whole other level). Finally, pour the dressing over the salad, add steak, and toss once more. Now I wasn’t kidding when I said this was easy. Easy and utterly delicious. I just bought the ingredients to make this salad this week, and I can’t wait. This salad is certainly enough for dinner and I suggest adding a grilled piece of bread to soak up the amazing dressing. Let me know what you think! But until next time, keep eating! Want to enjoy some of your favorite foods (cough Bacon, cough) without all the guilt? Thanks to Cooking Light you can enjoy the delicious taste of your favorite foods in a healthier, lighter way! 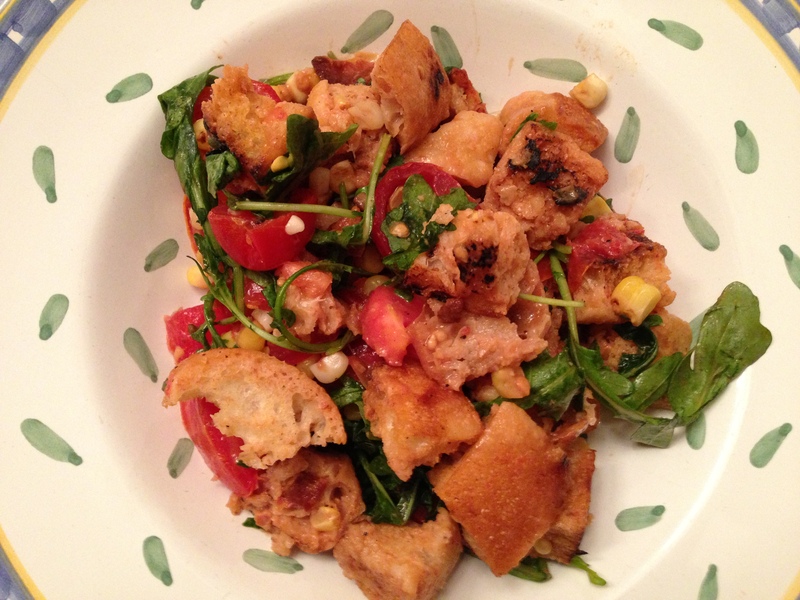 If you’re a bacon lover, you must check this BLT Panzanella Salad out. It’s packed with flavor, it’s light and fresh, it’s perfect for summer and and it’s a salad (that automatically means it’s better for you right??). That’s my justification and I’m sticking with it. For this recipe you’ll need: 1 tbsp. unsalted butter; 3 oz. Italian bread, trimmed and cut into pieces; 4 large ripe heirloom tomatoes; 1 c. small cherry tomatoes, halved; 1/8 tsp. salt; 3/4 tsp. pepper; 2 tsp. balsamic vinegar; 1 tsp. extra virgin olive oil; 1 cup baby arugula; 3 tbsp. canola mayonnaise; 1 tbsp. fresh lemon juice; 2 tsp. minced, fresh chives; 1/4 basil leaves; and 3 pieces of smoked bacon, cooked and crumbled. First, melt the butter over medium-high heat; add bread and saute for 5 minutes or until crispy; remove from heat and stir in corn. Next, sprinkle tomatoes with a dash of salt and pepper, and let stand for 5 minutes. Then, combine salt, pepper, vinegar, and oil in a large bowl. Add bread mixture and arugula. Toss to coat. Next, combine mayo, lemon juice and chives in a small bowl. Finally, add tomatoes and drizzle with mayo mixture. Sprinkle with basil and crumbled bacon. Voila, there you have it, a delicious salad that takes no time to make! Now, there’s no need to deny your cravings–this recipe will definitely satisfy your bacon-lover taste buds. Check this recipe out, and let me know what you think! But until next time, keep eating! Naked Chip Update: I’m home, recently graduated, and am looking for a PR/marketing job in the culinary world…..is anyone out there??? Now that I’m home I have more free time on my hands. Not to mention more pots and pans, an array of spices, more counter space, and more food in general to work with. My dorm kitchen seems minuscule to my kitchen at home. Oh have I missed this…. Since I have so much free time on my hands, I can exercise my creative license when it comes to food. On the menu today: chickpeas. Chickpeas are somewhat of a miracle food—they are loaded with protein (which is great for your waistline) and even happen to taste delicious. They are versatile, allowing you to do many things with them. You can season and roast them to make a delicious snack, turn them into hummus, eat them plain, or mix them into a salad. I decided to mix them into a salad. 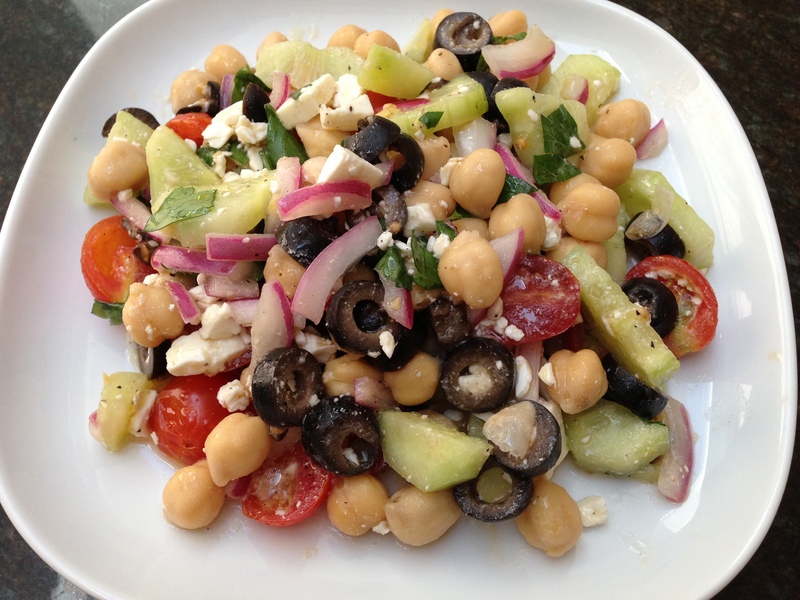 Yes Greek salad (I simply love all the flavors as seen in my earlier post It’s All Greek to Me!). You can’t go wrong with a simple Greek salad. It’s light and refreshing and perfect for a hot, humid, summer day—and trust me, living in New Jersey it’s hot and humid EVERY day, so I’m always on the lookout for a good summer salad. All you do is mix together olive oil, lemon juice, red onion, cucumber, grape tomatoes, feta, chickpeas, olives, parsley, and salt and pepper. It’s as simple as that. What’s so great about it is that you can store it and take it as a quick on-the-go lunch if you’re in a hurry or make a huge batch of it for a party. If anyone knows of any other great recipes using chickpeas, please don’t hesitate! I would love to know! But until next time, keep eating!